Walk in the footsteps of the Roman Emperors & throw your 3 coins in the Trevi fountain. 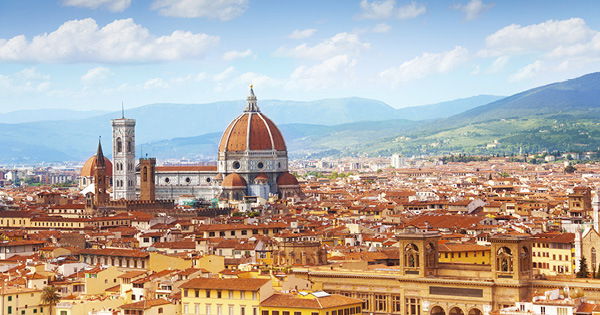 Enjoy traditional Tuscan hospitality, art & architecture in Renaissance Florence. Then finish up by wandering tiny streets in the floating city of Venice. Triple Share Discount - 5% off discount is only valid on selected Discovery and In-depth Explorer trips for 2019 Europe Summer 2019 departures. Offer is subject to availability and can be withdrawn at any time without prior notification. A non-refundable deposit of R1000 per person, per trip is required within 7 days of booking (per standard deposit terms) and full payment is due 45 days prior to departure. Triple Share Discount may be combined with regular brochure discounts if applicable but cannot be combined with any other promotional offer. Triple Share Discount applies to the land portion of the trip only. Offer not valid on special departures and interest groups, selected cruises, festivals and short breaks, and pre and post accommodation. Contiki is exclusively for 18-35 year olds.